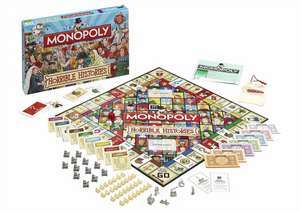 History has never been so horrible and neither has Monopoly! Take a journey through time with Horrible Histories Monopoly from the Savage Stone Age; dodging those Rotten Romans; running past the Cut-Throat Celts to conquer the Stormin Normans. Don't lose your heads by the Terrible Tudors and remember to keep calm when dealing with those Putrid Pirates. Finish your journey by capturing the Barmy British Empire and the Blitzed Brits. Pick up a Curious Chance - will you be forced to face an ordeal by cake? Or try a Treasure Chest - will you have to collect pee in a bucket? The game features six thoroughly historical playing pieces including a Crown; a Treasure Chest; a Shield; a Sphinx; a Chopping Block and Axe and your very own Rattus! Build cottages until you have enough British Groats to buy your very own Castle! It's learning the Horrible Histories way!